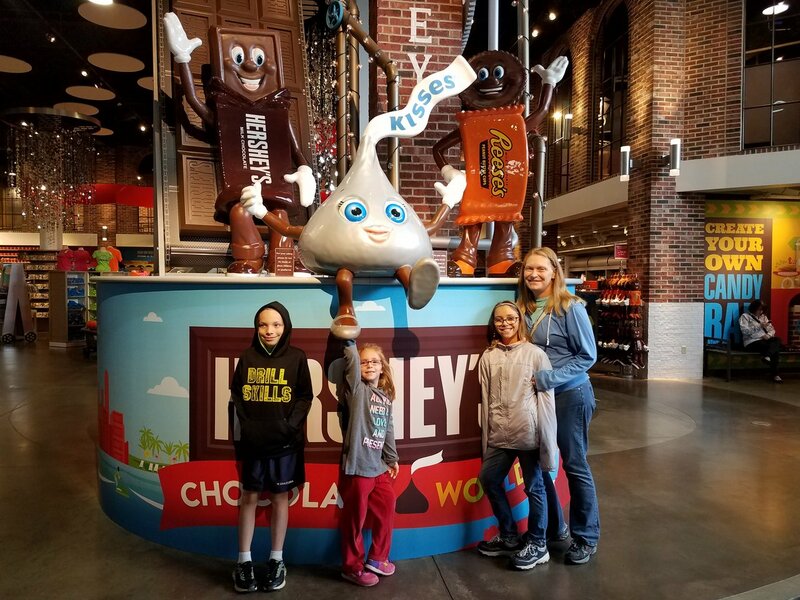 We thoroughly enjoyed our visit to Pennsylvania Dutch country, where we stayed for 9 days in April, making use of our Thousand Trails membership. 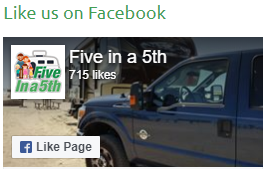 Of the two RV parks we stayed at, we liked the Hershey RV Camping Resort by far the best. It was clean, quiet, green, and made a great place for some down time. This was an opportunity to learn about a completely different culture from anything we’ve experienced before. The Pennsylvania Dutch are the descendants of early German-speaking immigrants, many of whom came to Pennsylvania seeking religious freedom. Contrary to what we thought, the word Dutch does not mean they came from the Netherlands. It’s an Anglicized version of “Duetsch”, the German word for the German language. Many of these immigrants belonged to the Anabaptist movement, who are today known as the Mennonites and Amish. We spent a day visiting the area around Lancaster to learn more about the culture there. We began by visiting the Mennonite Visitor Center and watching a short film about the Mennonite history. 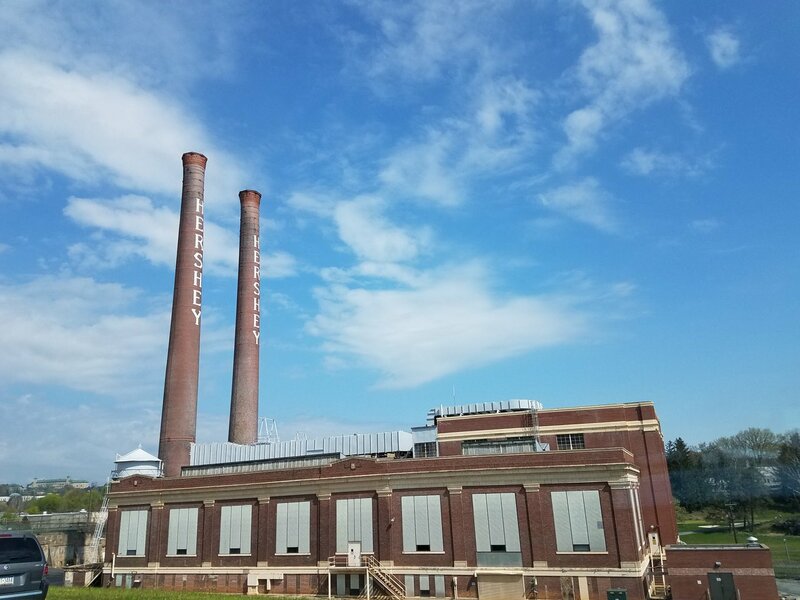 We avoided the more touristy “Amish Experience” types of sites and instead opted to visit several local quilt shops and bakeries and just enjoy driving through this beautiful countryside. The rolling hills are covered with farms and fields, dairies and grain silos. Everything is so green and lush. 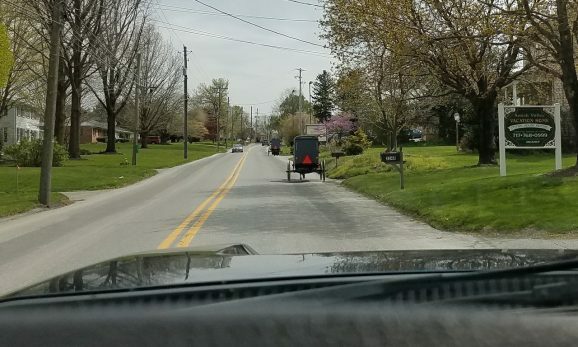 The streets have occasional horse-drawn buggies, the vehicle of choice for the Amish groups in the area. Several restaurants in the area advertise their “all-you-can-eat smorgasbord”, the term they use here for a buffet. We picked the smorgasbord at Bird-in-Hand Family Restaurant for our chance to try the Pennsylvania Dutch cuisine. We enjoyed eating things like buttered noodles, ham balls, chicken pot pie, and ham loaf. Then we went to the Bird-in-Hand Bake Shop to pick up a shoo-fly pie and some whoopie pies. 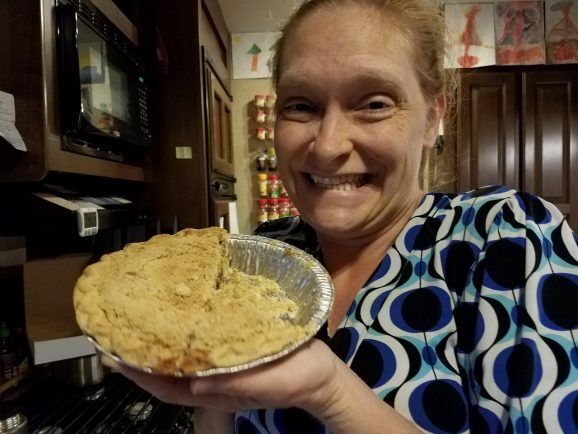 Shoo-fly pie is a crumbly pie with a filling made from molasses and originated in the area. Whoopie pies are sort of like big fat homemade oreos, but with very light fluffy filling. Both were delicious. Our other outing in the area was to the Hershey Chocolate World. We were hoping for a tour of a real chocolate factory, thinking it would be like when we toured the Tabasco Sauce Factory or the Tillamook Cheese Factory. Or even better, like visiting Willy Wonka’s factory. We were disappointed to learn the public is not allowed to tour the real Hershey Chocolate Factory. 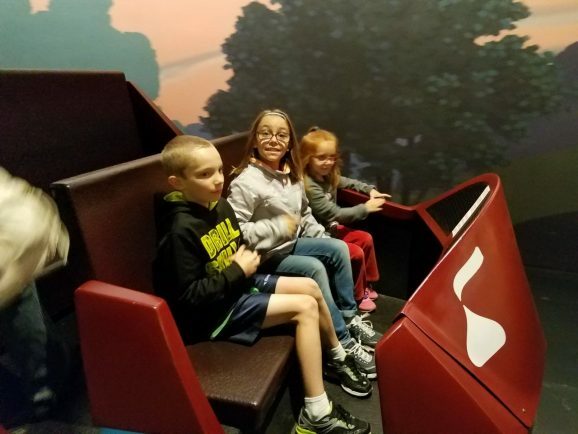 Instead, there is a 10-minute free “Factory Tour”, where you sit in a ride vehicle and go through a simulated factory. It’s sort of like a Disney Winnie-the-Pooh ride. The kids really liked it and I don’t think they even realized it wasn’t the real thing. 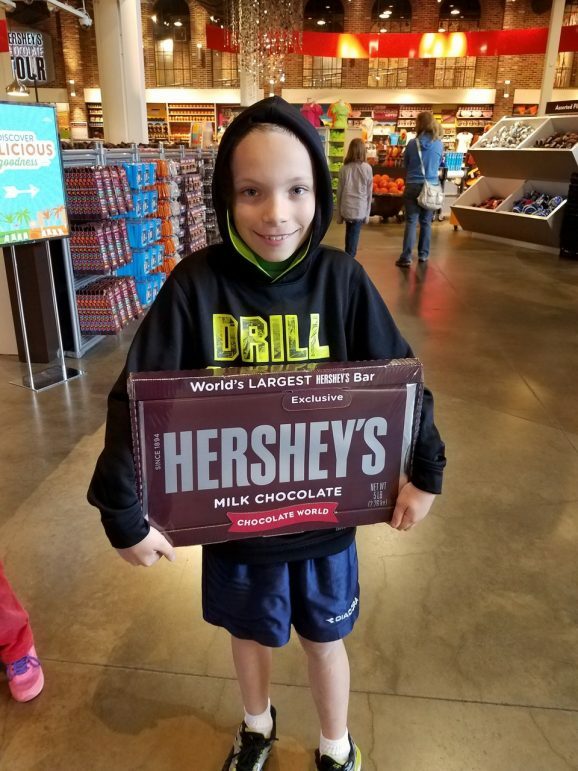 At the end of the ride, they give everyone a free mini Hershey bar, which the kids thought was fantastic. 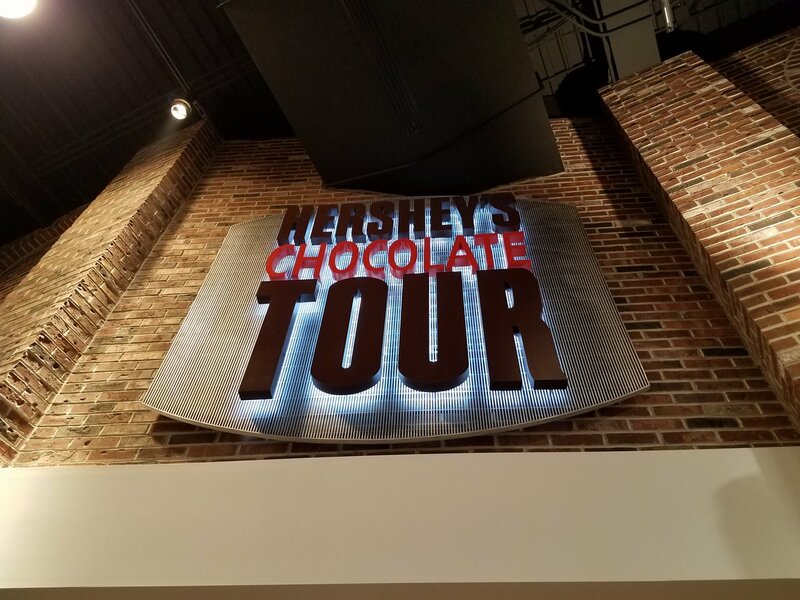 There is more to do at the Hershey Chocolate World, but we decided to just stick with the free tour ride. 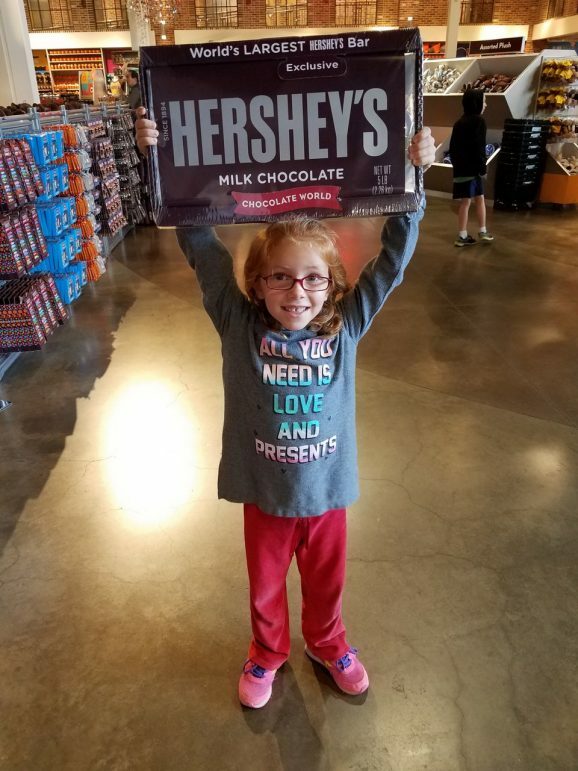 Yes, it’s Chocolate City here.